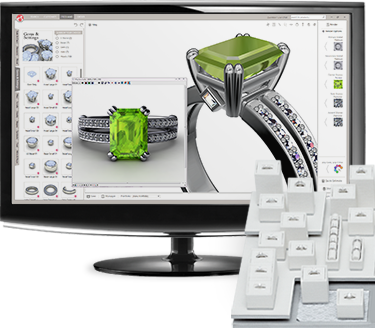 The Gemvision 3D CAD technology experience found at Lyle Husar Designs, is used to create unique, one-of-a-kind jewelry. When it comes to finding and purchasing jewelry for special occasions, the experienced staff at Lyle Husar Designs knows that even the largest collection of exquisite designer pieces doesn’t always meet the needs of every customer. If you’ve searched everywhere for that unique ring, bracelet, necklace or earrings without success, it’s time to visit the award-winning Design Studio staff at Lyle Husar Designs. At Lyle Husar Designs, we can make your dreams come true. As the premier jeweler in the Greater Milwaukee, Lake Country and Waukesha County region, Lyle Husar Designs is ready to bring your custom necklace dream to life. Schedule a consultation in our Design Studio to work with our award-winning staff, and see the necklace you’ve always wanted come to life before your eyes. We use the latest in CAD/CAM technology to create your design before we handcraft it, enabling you to modify your necklace. We want to make sure we get every last detail just right. Perhaps you have an old pair of earrings you’d like to refashion into something more modern, or you saw an advertisement that inspired your imagination for something new. Whatever your needs, the Design Studio at Lyle Husar Designs can create the perfect custom earrings in our Brookfield showroom. We have a wide selection of stones and metals to choose from — whether you’d like a luxurious pair of everyday earrings or you need a statement piece that’s destined to become an heirloom, the Design Studio staff at Lyle Husar Designs can help. Lyle Husar Designs can create and handcraft the bracelet you’ll turn to again and again. Why spend money on a premade bracelet that doesn’t meet your unique taste, and put it to waste in your jewelry box? With Lyle Husar Designs, you’ll love the attention and results you get from designing the exact piece you want — the first time. Whether you’d like to design your own engagement ring, wedding band or other special occasion piece, creating a custom ring at our Milwaukee-area jeweler is an experience to remember. We can help you choose the right materials for your specific style that also meets the needs of your budget. At Lyle Husar Designs, we have a large collection of loose diamonds as well as a wealth of ideas in our Design Studio that can help you purchase the distinctive custom ring you’ve always wanted. When it comes to ordering custom-made jewelry, you expect perfection — and Lyle Husar Designs is delighted to be the Wisconsin’s Most Trusted Name in Fine Diamonds & Jewelry. Our selection of loose diamonds, gemstones and precious metals is sure to satisfy a variety of tastes and budgets. Explore the options in our Brookfield showroom and discover why customers have trusted us with their fine jewelry needs for over 45 years.